Villagers in St Dogmaels in Pembrokeshire are celebrating the moment 900 years ago, when their corner of west Wales was thrust into the limelight of Anglo-Norman politics and religion. In 1113 monks from the Tironensian Order was granted land and money by Norman Baron Robert Fitzmartin, to establish what would become St Dogmaels Abbey. It was formed in 1106, and by 1113 the order's focus on silence, prayer and manual labour had made them so popular that it had already opened 117 monasteries in France, Wales and England. It was destined to become one of the most significant abbeys of its time. To mark the anniversary a number of events are being held over the year. These include a pilgrimage and a procession - and a showing of The Name of The Rose, the 1986 film about a medieval mystery starring Sean Connery, which was partly shot in the abbey's ruins. According to Nia Siggins, who runs St Dogmaels's Coach House community and visitor centre, the significance of the abbey was heightened even by its symbolic location. "Robert Fitzmartin tried to curry favour with the local Welsh population by establishing the abbey on the site of a clas (early Celtic church), which dated back to at least 600 AD," she said. "Which actually makes our anniversary celebrations a little bit arbitrary, as there's been a place of worship in one form or another in the location for almost 1,500 years," she said. "You have to remember that in 1113, when Baron Robert Fitzmartin gifted the land to the Tironensians, the Normans were still in the extremely early stages of their invasion of Wales. "There wasn't yet the military power or even the political will to take Wales by force, and so the barons had to find means of ingratiating themselves with the local population. "Although it started out as a small priory originally housing just 13 monks, the cachet and wealth which it rapidly developed brought great prosperity and relative calm to the area." Indeed, when the Welsh did rise up against Norman rule in 1136, Fitzmartin was the only Norman lord in south Wales who was able to defend his castle, in Cardigan. Thanks to the links he fostered with the Welsh, his son, William fitz Robert FitzMartin, was able to regain the family's lost Pembrokeshire territories, via a marriage to Angharad, daughter of Rhys ap Gruffydd. While St Dogmaels Abbey dominated the landscape and economy for more than 400 years, by the early 16th Century it was in decline. In 1536 its annual income had fallen below £200 per annum, meaning that it was earmarked for the first round of closures under Henry VIII's dissolution of The monasteries. Over the following centuries the buildings changed hands numerous times, and gradually fell into disrepair. Today, all that's left are some significant examples of early-Norman squat arches and broad stone walls. 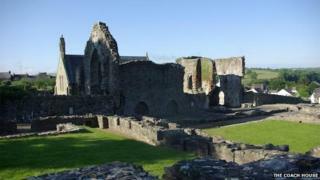 Yet Ms Siggins explained that even now the abbey continued to influence its surroundings. "There might not be much left in its original form, but if you look around the village, and beyond to Cardigan and Poppit Sands, then you quickly realise that most of the abbey is still here - just as part of other buildings," she said. "The Victorian coach house in which our project is based is a prime example of a building almost entirely made from materials plundered from the abbey. "In many ways it's sad that so much of the stone was quarried for other uses, but in others it's quite fun to try and spot them and imagine where they would have fitted into the abbey. "Part of our challenge is to bring what we do have left to life again, with imaginative audio tours and interactive virtual demonstrations of what it would have been like in its heyday," she said. The anniversary celebrations over the year range from a hike to St Dogmaels along the same Pembrokeshire coastal paths medieval pilgrims would have taken, to a medieval day and Shakespeare in the abbey.